Josh Hanagarne couldn’t be invisible if he tried. Although he wouldn't officially be diagnosed with Tourette Syndrome until his freshman year of high school, Josh was six years old when he first began exhibiting symptoms. When he was twenty and had reached his towering height of 6’7”, his tics escalated to nightmarish levels. Determined to conquer his affliction, Josh tried countless remedies, with dismal results. At last, an eccentric, autistic strongman taught Josh how to “throttle” his tics into submission using increasingly elaborate feats of strength. What started as a hobby became an entire way of life—and an effective way of managing his disorder. Today, Josh is a librarian at Salt Lake City’s public library and founder of a popular blog about books and weight lifting—and the proud father of five-year-old Max. Funny and offbeat, The World’s Strongest Librarian traces this unlikely hero as he attempts to overcome his disability, find love, and create a life worth living. Josh Hanagarne is a librarian at the Salt Lake City Public Library. He lives in Salt Lake City, Utah, with his wife, Janette, and their son, Max. "A sumptuous read, as funny, erudite, and energizing as a chat with a conversational intellectual, as engrossing and moving as a medical detective drama… The book leaves all of us who've read it feeling a little stronger and brighter ourselves." "Josh Hanagarne inspires in his pursuit to break the shackles of Tourette Syndrome and live his life to the fullest, as a husband, a father and a librarian. 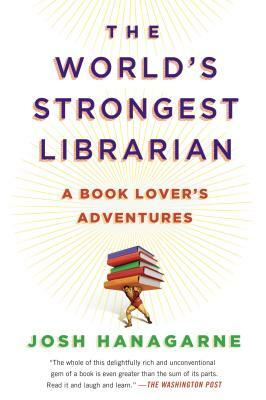 Insightful, heart-wrenching and delightfully humorous, The World’s Strongest Librarian is a triumph!" —Cory MacLauchlin, author of Butterfly In The Typewriter: The Tragic Life of John Kennedy Toole and The Remarkable Story of A Confederacy of Dunces. "Josh Hanagarne has an astonishing story to tell, and he does so with insight, humor, grace, and wonder. All human beings suffer and struggle. Through the lens of his own miraculous experiences, Mr. Hanagarne illuminates the path to joy and the infinite possibilities of transcendence." “Josh Hanagarne is a giant of a man and a giant of a writer… This guy is the real freaking deal in a very fresh and exciting way." "The whole of this delightfully rich and unconventional gem of a book is even greater than the sum of its parts. Read it and laugh and learn."